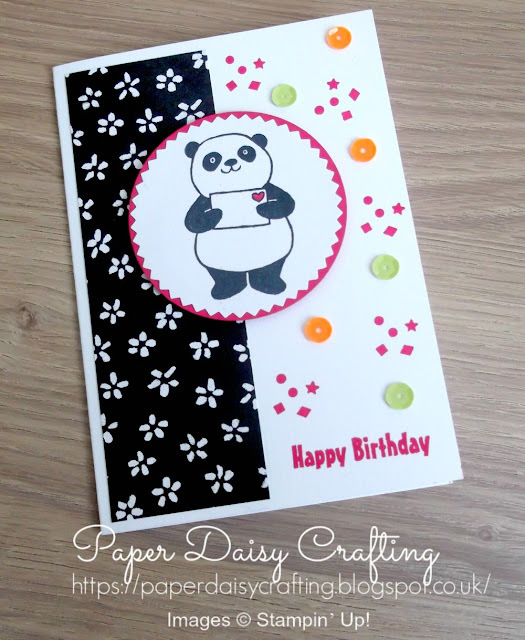 Paper Daisy Crafting: More fun with Party Pandas from Stampin' Up! 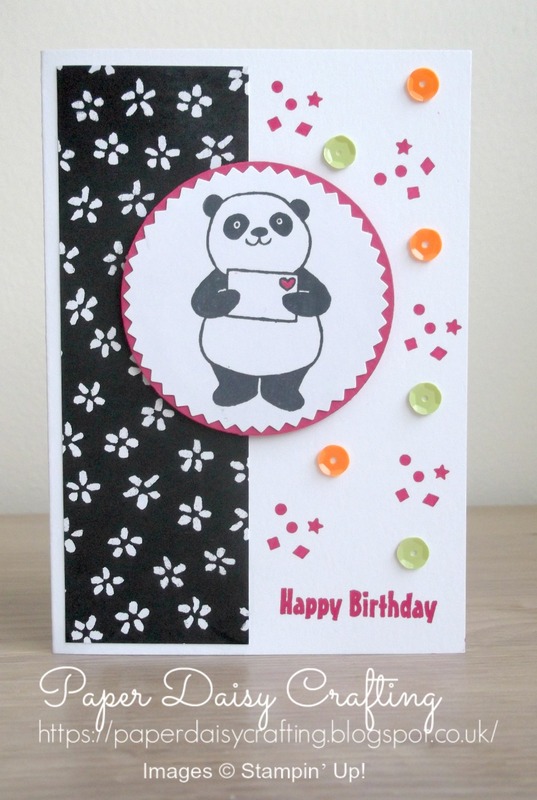 More fun with Party Pandas from Stampin' Up! Thanks for joining me again today. A few days ago I held my monthly card class and we made three cards all featuring the Party Pandas stamp set, which is one of the choices in the Sale-a-bration. Spend £45 on any products in the current catalogues and you get to choose a FREE product from the two Sale-a-bration leaflets - click on the links to the right to see all the lovely things available. This was the first card we made in the class - we usually have at least one or two beginners, so we start with something fairly easy and straight forward. We used so many products that I love on this card. Of course there are the pandas, but we also used the lovely Starburst punch and mounted it on a circle punched with the 2 1/4 inch punch. Using these punches makes card making so quick and easy but the results are so professional! The other products used (which I also love!) were a small piece of the black and white Petal Passion patterned papers and of course the fabulous self adhesive sequins. I have always loved using sequins but adhering them can be a bit of a nightmare - not any more! I promised the ladies at the class that I would make a video of how we made the card so without further ado, just click HERE to see it or on the image below. I'll be back soon to show you another of the cards we made at the class. All the products I have used to make this project are all available from my online shop and are listed below. Simply click "Shop Now" button on the top of this page or click any of the images below to go direct to that item in my online Stampin’ Up! shop. If you order from my online shop please use my monthly shopping code (below) to receive a free thank you gift from me as I really appreciate your business.